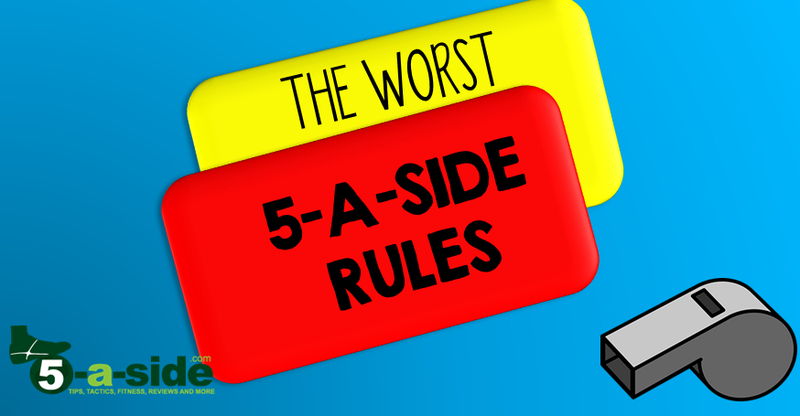 I’ve recently published a list of resources for 5-a-side rules. On that page you can get all the resources you need if you’re playing your own game, running a tournament, or just want to refer to the way that the game is popularly played. In my many years of playing 5-a-side I’ve played a lot of different types of rules. I’ve played with barriers round the pitch and without; I’ve played kick-ins and roll-ins; I’ve played where the ball can go over head height and where it can’t; and I’ve played where you can go in the area and where it’s forbidden. However it’s played, it’s still an incredible amount of fun to play any form of 5-a-side but there are some rules in popular usage that make very little sense to me. In this article, I’ve listed a few of the popular rules that I think deserve some debate. Here are my thoughts, but I’d love to hear what you think about them in the comments below. For those reading this in other parts of the world, let me explain. 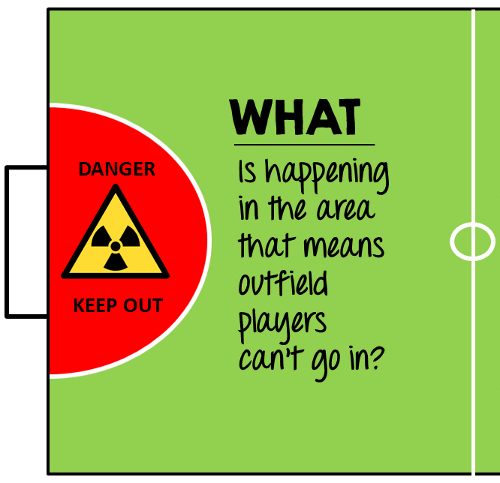 In UK 5-a-side it is common for outfield players not to be allowed inside the area. Only the goalkeeper can operate in the area (and isn’t usually allowed out) and neither attacking or defending players are allowed into their semi-circle shaped territory. I’ve thought about this for a while and I’m not sure why exactly we have this rule. It doesn’t seem to add much to the game and, if anything, only appears to add confusion and controversy. In my experience, people totally obsess over potential infringement of this rule with players and referees all seemingly on edge to be the hawk-eyed spotter of the merest tip-toe into the area. It leads to some of the most annoying penalty kicks and disallowed goals you’ll ever see. The most irritating part of this rule is the wrestling that goes on because of it. You’ve probably experienced this yourself, where two opponents engage in a strange pushing and shoving game to either maneuver each other out of the way without going in the area or, more sneakily, push the opponent inside the area. These sort of melees just don’t feel right. game. What’s so sacred about the 3m radius around the centre of the goal anyway? What were the people who made up this rule worried about when they decided that players weren’t allowed in it?! What is the worst case scenario if you allowed other players in it? Might you have all of your 4 outfield players line up in some sort of formation across the goal to prevent any goals being scored? Maybe, but the same applies to full-sized football, and I haven’t yet seen a game where all 11 players form a human wall across the goal as a game-wrecking tactic. Or could it be that they’re worried about attackers putting in bad challenges on the goalkeeper and from a safety point of view it’s best to keep players and keeper separate? With the slide-tackle generally outlawed (more on that below), I don’t see this being much of a risk. Maybe it’s to prevent goal-hanging, but I’m not convinced anyone is going to spend much time hanging that close to the goal. Verdict: I’m not sure why we play this rule – personally, I’d like to see more places trialing playing without it. This is another very frustrating rule that is impossible to enforce accurately and consistently. Let me declare an interest. I’m 6’4 (193cm in new money) so I’m often the tallest player on the pitch. Now, if you care to read the rules properly (which, let’s be honest, if you have a social life you probably haven’t), ‘head height’ is sometimes deemed to be ‘the height of the tallest player on the pitch’. So, when I’m playing, most people have got a little extra leighway, in theory. But the number of times that I’ve been on the pitch and the referee has blown for a free kick when the ball has not even passed near to the height of my head is unbelievable. Many times I’ve been left wondering who represents the mythical head-height that the referees have in mind. Michael J Fox, Odd-job, one of the munchkins? ‘Lujacku’ isn’t alone there – dozens of similar tweets can be found about that goal! Why, oh why, oh why do we need to always think we should be playing that rule for any form of small-sided football?! For balance, I can see why we have some concept of wanting to keep the ball on the ground and not have players smashing the ball high into the air. It should make for a quicker, more technical, passing game. But sometimes I yearn for a deft little chip forwards, a dink here, a loft there. Something like the Scholes goal. Verdict: This is another rule (like the enforcement of an ‘area’) that referees would probably love to see the back of, and it would free them up for concentrating on much more important issues. If the goal is anything over 4ft high, definitely scrap the over head height rule. Time for a change of tack. This is one that I am absolutely in favour of: the outlawing of slide tackles. There are few sights more beautiful than a well-timed slide tackle, where a player gracefully drifts across the floor to dink the ball away from danger whilst at full-stretch. But for every display of grace and poise when a player goes to ground, there seem to be 10 more examples of reckless buffoonery. If we were all professional players with insured contracts and were protected by top-class referees, I’d be the first to welcome slide-tackles into the mix. Sadly though, we’re mainly all just playing 5-a-side as a hobby and need our legs in reasonable working order the next day for work. So, for this reason it’s quite right that the slide tackle is banned on the 5-a-side pitch – keep out the nutters. It’s for the greater good. Verdict: yep, let’s keep this one. Fun as slides are, not everyone can be trusted. No passing it back to the goalkeeper directly from a roll-out. This is an interesting little rule that catches out many a 5-a-side newcomer. I’ll be honest, I’m on the fence with this one. On the one hand, it’s absolutely infuriating seeing somebody on your team who hasn’t listened to this rule end up violating it. On the other hand, because of the special impenetrable area that the goalkeeper occupies, if you didn’t have this rule you’d just pass back to him all day long if you wanted to waste time. The most annoying thing is when a penalty is given as a result of a back pass. What is that about?! It’s absolutely sickening to concede! At worst this should be an indirect free-kick. Verdict: on balance, it’s probably a rule worth having, but shouldn’t be punished with anything other than an indirect free kick. Do you agree with the verdicts above? Which rules drive you mad? Which do you think should be scrapped? Do you play 5-a-side outside of the UK with any significantly different rules? If you’ve got thoughts on any of these matters, let us know in the comments below. And a couple of readers decided to re-think their use of both the head height and the area rules! And that’s the point of this article. To make you think about the rules you have been using and whether they’re really making your game better, or if they’re just old relics of how you think the game needs to be played. Play the game the way you want – after all, it’s your game. Ha ha. Was a good semi. Erikson’s free kick was another level. Was a great game though. After last nights result for blades i might be in north london come end of may. Lol. It’s a proper strange coincidence though that your dad is a blade. Especially as i mentioned my spurs supporting mate. I weirdly now know more spurs fans than any other prem club. A lad that goes out with our lasses best mate from uni is a season ticket holder at white hart lane. Mad. I prefer your dad to mine because my dads a wednesday fan! Ha ha. Ha ha. Used to write letters to tony currie all time when i was a kid asking him about his career and to be fair he always responded. I’d only seen him play on video but loved him. My grandad reckons he was as good as george best. Ha ha. Where you from originally then? Are you from these parts or are you like my mate who was born in scarborough but for some reason is a mad spurs fan! Ha ha. That’s awesome. My dad is a big Blades fan (that’s what got me started) and he says he was pure quality. On the Hoddle sort of level. I was originally born up north, but moved down south fairly young and so, like your unfortunate mate, am a Spurs fan too. It was interesting this season with Spurs playing Sheffield United – I honestly didn’t care who won. I still follow both teams, but I find it a lot easier to keep up with Spurs because they’re in the Prem. Yeah mate. I know the pain. I’m a blade too. Been to wembley a few times though at least. Ha ha. Sheffield united’s kit man is our teams gaffer’s best mate so he get a lot of cast offs. Having said that so do i. Lol. Kit mans bro plays for us as well. If you are ever in sheff give us a shout and come meet the lads. Would love to do that mate. Chances are I will be up there at some point (though I’m London based). I bumped into Tony Currie’s nephew playing in one of the top 5-a-side teams and that’s been my best Sheff Utd discovery yet! One last point on this. A lad that plays for our 5’s team. Coild easily get paid to play. But he’s not been playing for last few months because he’s been on tag for being pissed up fighting in town. That’s a story I’ve heard a dozen times over now. You could probably make a very good Championship standard team with all the wayward 5-a-side players knocking around. I could probably knock up a great side if i could get them out of boozer/bookies for long enough. In fact now you’ve got me started. Ha ha. The number 1 problem in this country is the culture away from football. We don’t associate drinking too much and winning nothing. All the worlds top players at the moment don’t drink and live for the game. Probably the reason bale moved to madrid because the culture in europe is different. Even the germans have a better culture than us. A mate of mine who i’m seeing tonight he grew up with me and my bro. Probably the best player i’ve ever seen with a ball at his feet. Been at wednesday and barnsley academies. Got released from both. Both occasions because of his attitude. Influenced by his parents to be fair but none the less it’s shaped the life he now leads. He basically always has and still does carry too much weight. He lives in essex now but he like me is from sheffield. We all went to myrtle springs. He was in the same year as kyle naughton and wade fairhurst (a lesser known pro) and was the star of that school team. So you might think attitude is the difference. Well my missus was also in that year and she’ll tell you that both naughton and fairhurst were never at school. And if you ever see these lads in public you can guarentee you’ll be in a town centre boozer. The difference is being a natural athlete. Attitude doesn’t matter to academy coaches or it seems ability but if you can run all day or are a specimen in the ilk of lukaku you get to be a pro. I’ve known a lot of this happen. Even to my dads generation. Darren knowles (retired hartlepool player) and his bro matt who many say was a much better player but he likes the drink. In fact reportedly missed a trial with man city because he’d been on the ale. Darren didn’t make millions and still lives on my old eatate but the difference in that case is he looked after himself and was a natural athlete. The drinking culture is the problem and the clubs turning a blind eye to it. Best player this country has ever seen in my opinion is Gazza. That tells you all you need to know about the culture of this country. Haha, keep it coming mate, I’m loving reading it. It’s making me think a lot. Booze has a lot to answer for, not just in football but in society as a whole. Some of the funniest (yet most tragic) stories to me are of the Arsenal team when Wenger first came in. The foreign players just looked at our English lads nipping off to the boozer after training and thought they were absolutely mad. The English lads just thought it was normal. Just shows how the culture in this country was ridiculous. Seems the culture is that you have to be all things to all people. It’s not just enough to be great at football, there’s an expectation that you have to do it whilst also impressing your mates and being one of the lads. That is until 10 years down the track and you look at all your unfulfilled potential. George Best and Gazza were poster boys for it, but there are so many more. Maybe an article on it in the future…. Didn’t know you were from Sheffield – first team I ever started following were the blades (and I’ve suffered ever since). The england DNA project to me doesn’t have a purpose. They are trying to create a team of universal soldiers instead of picking teams with players of different strengths and weaknesses to create a winner. England could get a good team together with the players they have now but they always fall to default setting to crow bar in the big names. At tournaments you always look at tge starting line up and think where is the fluidity. Problem with the big names is they play at clubs with a lot of foreign big names so they can get away with inconsistency. But i’ll give the FA something to look at. Go right back to the under 7’s and under 8’s at grass routes. Tell the parents to stop screaming at there kids and let them just enjoy playing win lose or draw because so many people i know that as adults are just not comfortable on the ball because they never learned the basic principal. I still don’t enjoy the winning mentality as an adult. I just wanna kick the ball around. I always say to the lads but it never sinks in “it doesn’t matter if you lose. It’s how you lose that counts” as long as you played as hard as you could and had fun then you’ve achieved your goals. I completely agree. I’ve come of the pitch after losing still buzzing at the way we played, but there are some who would think that this attitude is disgraceful. To me, the increased organisation and the will to win is what stops us producing players that have a bit of magic about them. If we backed off and let the youth play small-sided games and allowed them to come up with their own solutions then we’d have a much better development culture. Even the way we’re pursuing futsal, it won’t make any difference if the parents are watching it shouting at the kids to do this, or do that, creating yet more robotic players. If you want to help the kids, just let them play. A plus point that can be said about the goal areas is it’s like a small sided version of an offside trap when you think about it. It’s a forbidden area behind the defence. 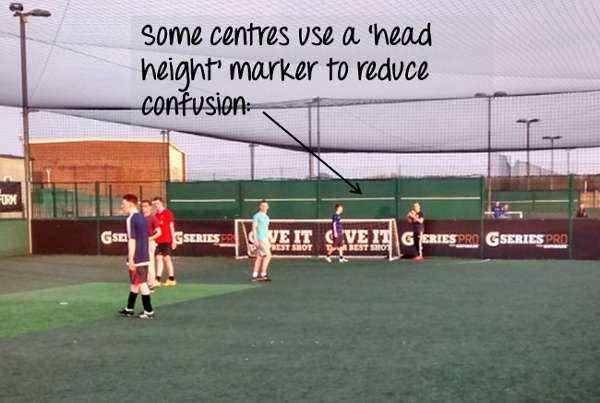 Also i think the head height rule is an equivelant to the smaller heavier ball used in futsal. I personally think the FA should embrace the typical 5-a-side in this country instead of trying to roll out futsal everywhere. It’s like shutting the gate after the horse has bolted. We need to spend less time copying other countries and more time embracing what we know. Have a style and an identity to the english game and stick to it. When they talk about kids playing small side i think the game with the boards is better because the ball is always moving. You don’t get time to rest which aids fitness and having the composure when all the others have no energy left to breathe let alone think. I could talk about this all day. I hadn’t thought about the areas as an offside trap, Darryl. Good point there. Some of your thoughts on futsal have also really struck a chord with me too. The FA have got into a complete love-in with it, which seemed to reach fever pitch around the time of the Brazil world cup. It’s a great game, but I feel the FA have left other small-sided formats out in the cold, unwisely in my view. The Germans are a wonderful example of having an identity and sticking with it. It has been said that they reinvented their game after the 2004 world cup fiasco, but they just became more organised about playing to their natural strengths. As Klinsmann said: “We eventually decided to go down an attack-minded route, passing the ball on the ground from the back to the front line as quickly as possible using dynamic football.” See this article for more: http://news.bbc.co.uk/sport1/hi/football/world_cup_2010/8789682. In fairness the FA are trying to reinvent our playing culture with their England DNA launch (http://www.thefa.com/news/england/2014/dec/england-dna-launch) but the philosophy seems a bit more wooly to me. Anyway, I seem to have gone off on one there so let me bring it back in. Yes, I absolutely agree traditional 5-a-side has a place in the traditional landscape. After all, people will always play the game at some level with boards round the pitch to keep the ball in play, plus they love the lush artificial turf as a surface to play on. Futsal has lots of great points, but doesn’t have those two, so I think traditional 5s will always have a future. I’m all for outlawing slide tackles too – when it comes to a little game of 5-a-side I’d rather not get my leg broken. However, when it evolves into a “no playing the ball on the floor” rule, just about everyone ends up with their own variation of what that means, leading to all sorts of confusion and frustration! Dave, I absolutely agree. It’s a shame though – a perfect slide tackle is a thing of beauty. No head height is difficult to enforce. Actually, I think that if you’re going to try to have a rule like that you’re best off putting netting up over the court at the 10ft height, as I’ve seen before. Then, you just play for a stoppage if the ball hits the netting – there can’t be any arguments about that. Really good article. Some of the things you mention have bothered me for a while. People are obsessed with the over head height and the areas. We stopped playing the area rule in our kick-about and honestly, not a lot changed, apart from there were less arguments. Thanks Adam, I’m glad it has made you think about the rules that you’ve been playing! That was the whole point of this article, to make people think about what they’re doing and whether it might improve their experience moving to different rules. I think it depends whether you have boards or not. At goals the is a fence about 8ft high and that is deemed head height and the play doesn’t stop unless it’s intentional or some heads it. I once played in a league where it wasn’t allowed above your waste and even deflections were a reason to stop the game. I used to play in a 6 a side with no boards. No head height rule and you were allowed in the area and the keeper allowed out. It was quite good because the keeper could act as a sweeper so you could push on with a bit more confidence. Like i say i think the rules should depend on the pitch size and whether there are boards round the side. I think goals soccer centres have got there rules spot on for the style of game. Hi Darryl, I agree that a different set-up can require different rules. I just wish people would think more about why they’re using them as it doesn’t always make sense. The one about playing to waist height is a perfect example – what is that achieving?! You speak a lot of commonsense there. I’m also a fan of letting goalkeepers out of the area – I think that has opportunity for lots of good pressing and passing.